KANSAS CITY, MO and SAN LORENZO, CA, October 31, 2018 – Orange EV and Oakland Pallet Co., Inc. (OPC) today announced the deployment of an Orange EV T-Series pure electric terminal truck to the Oakland Pallet manufacturing and recycling facility in Modesto, CA. The 100% electric Class 8 truck, charged with on-site solar, moves product on-site and makes local deliveries. “When purchasing a new truck, we chose electric over diesel for a few reasons, most importantly to reduce emissions in our Modesto community by utilizing our solar array for power instead of diesel combustion,” said Carlos Padilla, Vice President and co-owner of Oakland Pallet. “But the beauty of the Orange EV terminal tractor is that it can be used to make local deliveries and pick-ups without tying up a long-distance tractor and driver.” Terminal trucks (aka yard trucks, hostlers, spotters, goats) typically operate within the confines of container-handling facilities but can also be plated and registered for on-road use. Orange EV trucks are available in a range of configurations, designed to meet site-specific requirements. For Oakland Pallet, the decision to deploy electric was both economic and environmental. Conscious of the source and lifecycle of their energy consumption, OPC installed a solar array at the Modesto operation. “Investing in the Orange EV truck was a win-win. It’s charged with on-site solar so doesn’t add to our energy costs, and it eliminates diesel costs and emissions,” commented Samuel Garza, Modesto Plant Manager. “The telematics also save money and time, sending automatic notifications so we can take care of small issues before they become big problems.” All Orange EV trucks are equipped with an onboard telematics system which provides real-time data for operations and reporting. 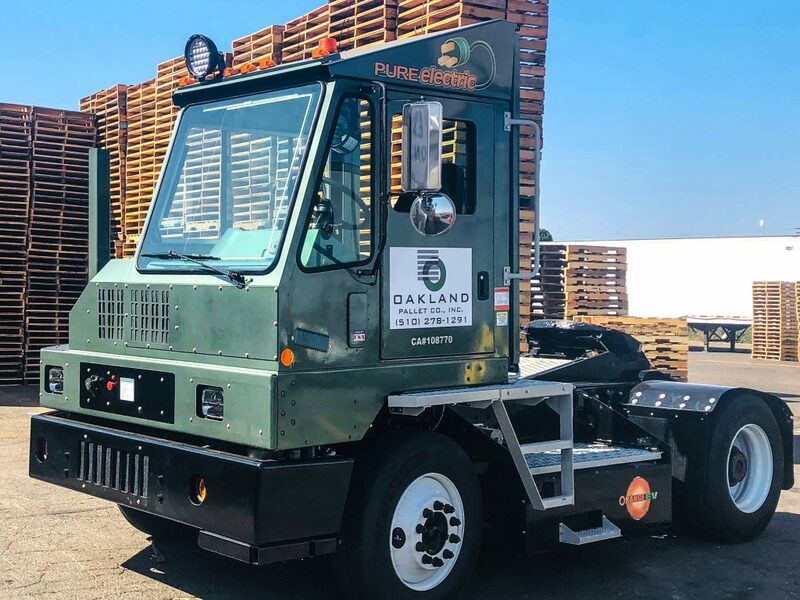 Oakland Pallet utilized funding from the Hybrid and Zero-Emission Truck and Bus Voucher Incentive Project (HVIP) to purchase their Orange EV truck. HVIP is currently open, enabling discounts of up to $165,000 per Orange EV terminal truck. Oakland Pallet Co., Inc. (OPC), established in 1987, is a privately owned and operated business headquartered in San Lorenzo, California, in the heart of the Greater San Francisco Bay Area. 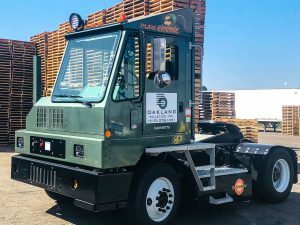 With more than 200 employees and multiple facilities throughout California, Oakland Pallet is positioned to efficiently meet customer needs offering new pallets and services ranging from pallet recycling and custom pallet design to on-site inventory control, trailer staging, and just-in-time delivery. A certified Bay Area Green Business, OPC is committed to reducing its environmental footprint, offering best quality, sustainable pallet solutions. Oakland Pallet’s customer-base spans a wide range of industries including wineries, tech, food & beverage, major DC’s, and a variety of manufacturing companies throughout California.